I love sarcasm and dry humor. I know that not everyone appreciates a good sarcastic comment….but I do! I think it is good to lighten things up sometimes…especially as parents!! I think we get too serious about life and can get bogged down with the mundane details of life. I can't say that this is going to bring you any wisdom…but if you are a parent, especially a mother…I think you will appreciate the humor of this funny quote for parents. We have been busier than usual lately…or maybe I have been busier than usual lately. Either way…it seems like our house has been getting messier and messier. I thought this fit the bill for what seems to be going on at my house. 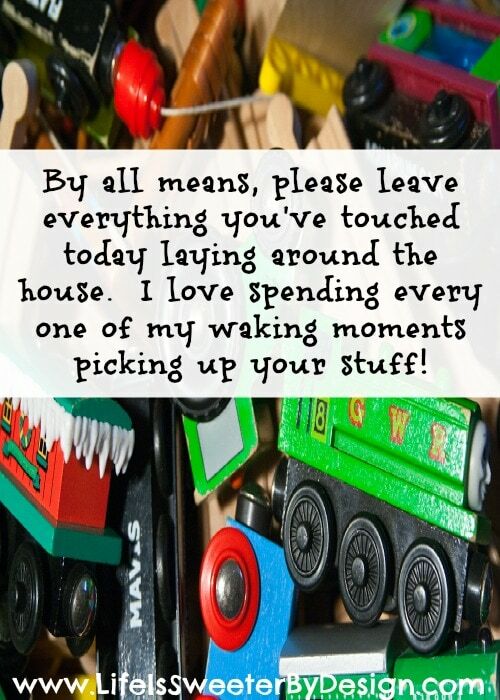 I don't actually pick up everything my kids leave laying around…but some days it does feel like that! I have been giving one of my kids a basket and having her walk through the house and just fill it with anything that belongs to her. Since her bedroom is upstairs it seems like she just leaves her stuff all over the main level of the house to avoid taking it up the stairs! Can you relate to this funny quote for parents? Do you ever feel like all you do is pick up after other people? 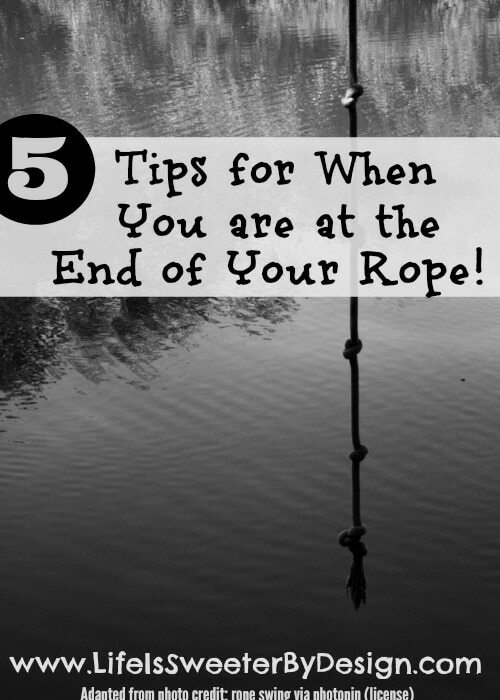 If you are At the End of Your Rope…you may want to check out some tips to keep you from falling! Oh yeah…. been there, done that! I got so tired of the kids dumping stuff on the kitchen counter that I warned them — 3 times over about that many days — that after three warnings, all future stuff would be trashed, sold, or confiscated for my own personal use. UGH! My daughter (10) apparently didn’t believe me… until she saw her headband land on top of the coffee grounds. She learned quickly! My son is a little slower on the uptake. Haha, I’ve got a toddler and I pretty much give up trying to clean up after her. I’ll clear out our bedroom of toys and maybe straighten up the living room, but I just know it’s gonna get destroyed again the next day. It just doesn’t last does it! Oh yes, you are speaking to me and my husband does not understand why I don’t want to pay to get a house cleaner. Why pay someone $100 to clean my house for it to look nice for maybe… 20 minutes before the kid hurricane comes in. My youngest can create a huge mess in a heatbeat. However, my teens aren’t off the hook. They love leaving cups aren’t all over the house or trash. I’m my one worst enemy in this regard. I leave stuff scattered all around my office all the time! I feel like that today. It doesn’t matter how much I pick up, by the next night my 4 yr old has turned this place into a hoarder’s nest. Drives me crazy! This is so funny! I am all about sarcasm. In fact, I’m pretty great at it. Thanks for sharing! I know the feeling all to well! Definitely. Most of us feel that way after doing loads for laundry for able bodied young adults who are ensconced in front of the TV as we sweat away. Lol these are for me I guess. let me share with my parent now! Amazing share!